These skewers are super capr-easy. And, they’ll use up produce from gardens I know that some of you are growing. 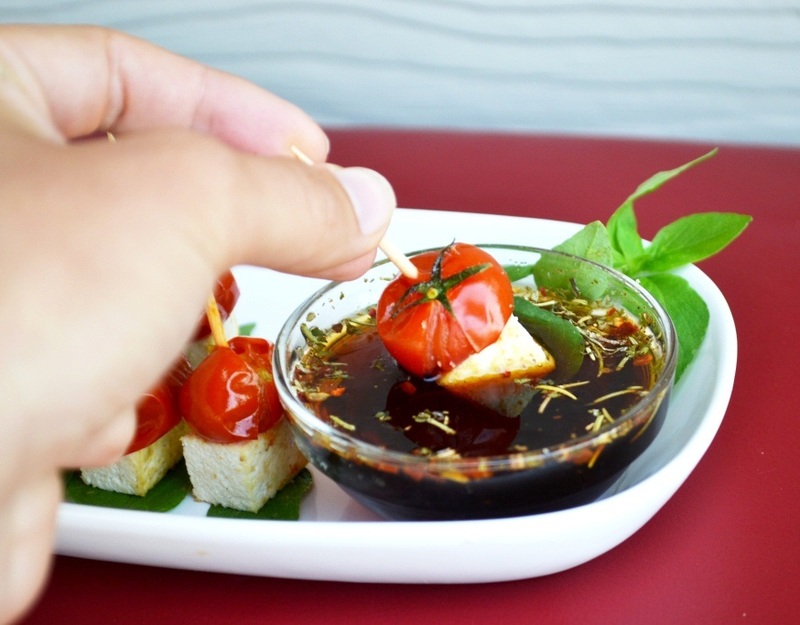 Ripe cherry tomatoes literally burst with flavor while roasting in the oven, tofu sizzles, and fresh basil, well…freshens up the whole flavor. All of this gets dunked into a nice cool bath of seasoned balsamic vinegar. I love any take on the traditional caprese salad. One of my favorite versions that I’ve had is at a little place called the Saxapahaw General Store in Saxapahaw, North Carolina. My parents came to visit me so I took them to the locally-supplied restaurant which is located in a converted gas station. Cool, right? My mom and I decided to do a sandwich swap and ordered a roasted vegetable sandwich and a Mozzarella Caprese sandwich. Although it’s been over a year, I can’t get the taste of the Mozzarella Caprese out of my mind. A freshly baked baguette, meaty slices of ripe tomatoes, delicate fresh leaves of basil, and thick chunks of mozzarella, all coated with a home-made balsamic vinaigrette. Yum. 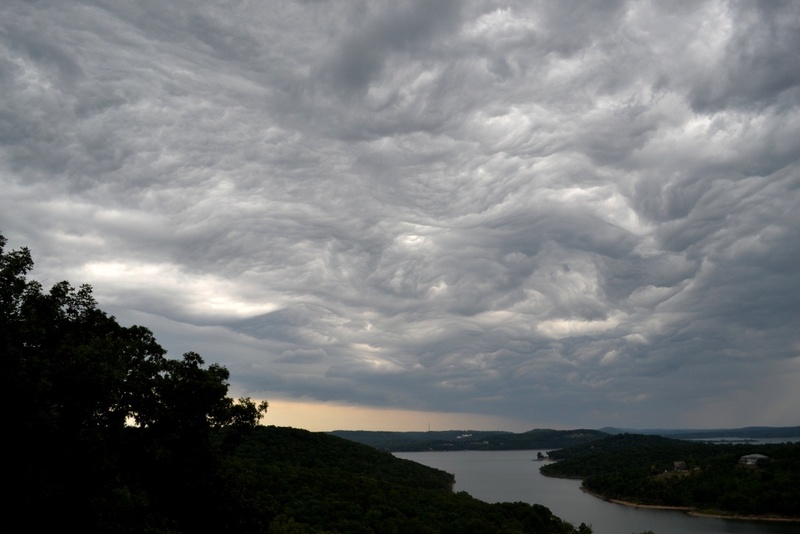 Once I saw the clouds, I started worrying that the downpour that would surely ensue would blow all of my little cherry tomatoes away. 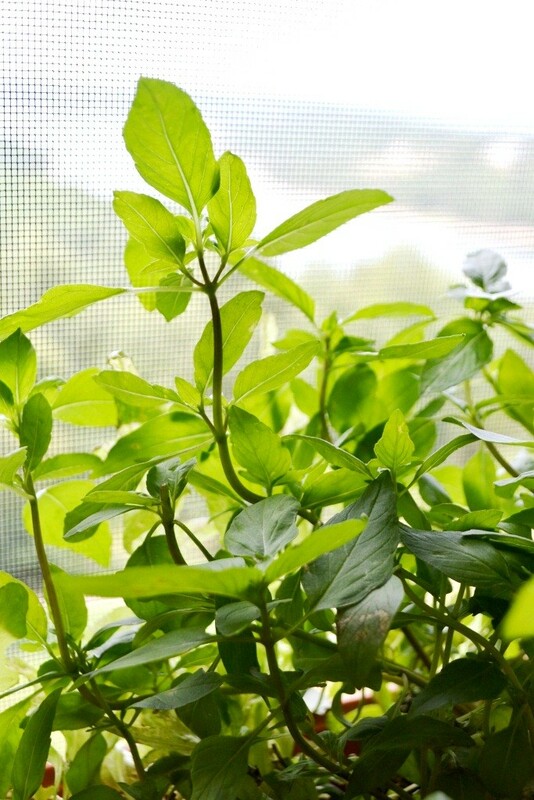 I’ve been working hard on taking care of those little guys – I mean, I get a gym membership’s worth of strength training lugging two watering cans out to the plants each day. I set down Hemingway and ran upstairs to go collect all of my little tomatoes and I saved them all before the sky opened up. Fast forward a few hours through a soldier falling in love with a nurse, me writing a blog post for the Chamber of Commerce, and working on applications for grad school. Lunch rolled around and my collection of tomatoes sat waiting for me in a little bowl on the counter. And then, inspiration hit: a summery lunch that would use all of my precious tomatoes and some of the basil leaves that have been winding wildly towards the screen window they sit by. 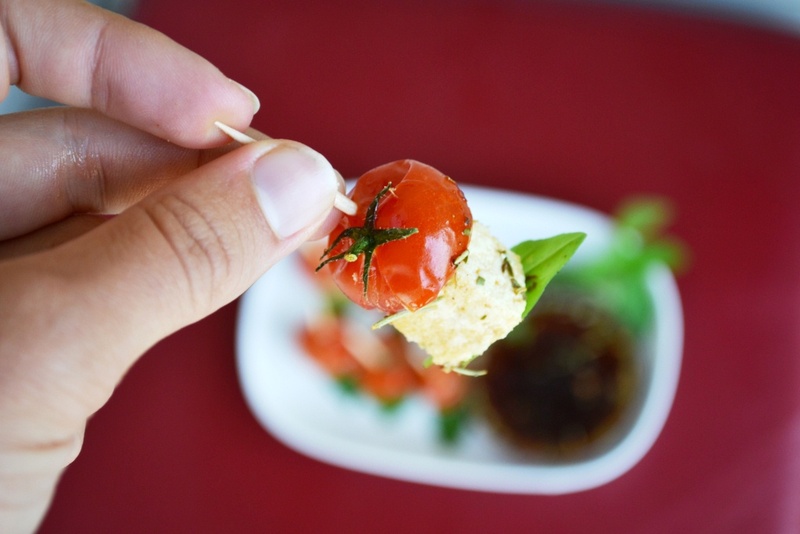 To make my cap-reasy salad skewers, all you need are some tiny cherry tomatoes (aren’t they the cutest? ), a few cubes of tofu, some fresh basil, and some good balsamic vinegar for dipping. Pop ’em in the oven, pop ’em in your mouth. Bada-bing, bada-boom. 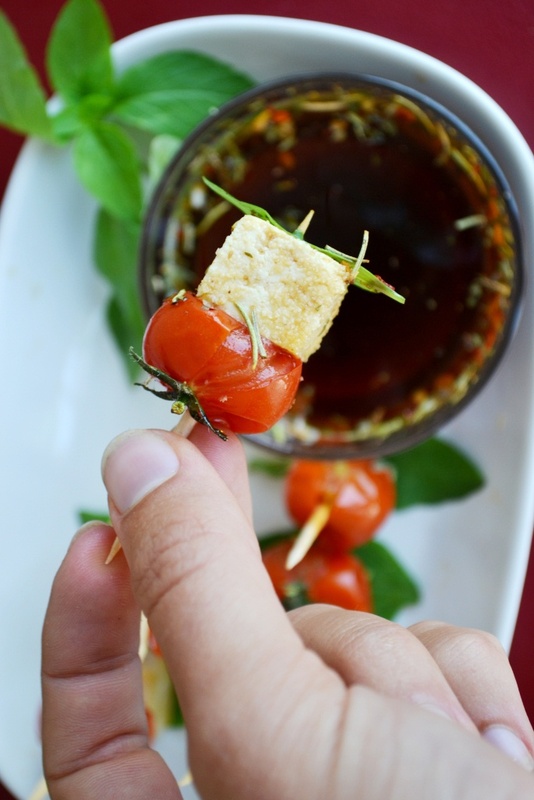 These mini-skewers are as cute as the ingredients that top them. They’d be perfect as hors d’ oeuvres at a party, a fresh summer lunch, or as an appetizer at a barbeque. Or as a refreshing snack in the midst of a Snacker Day Saturday! 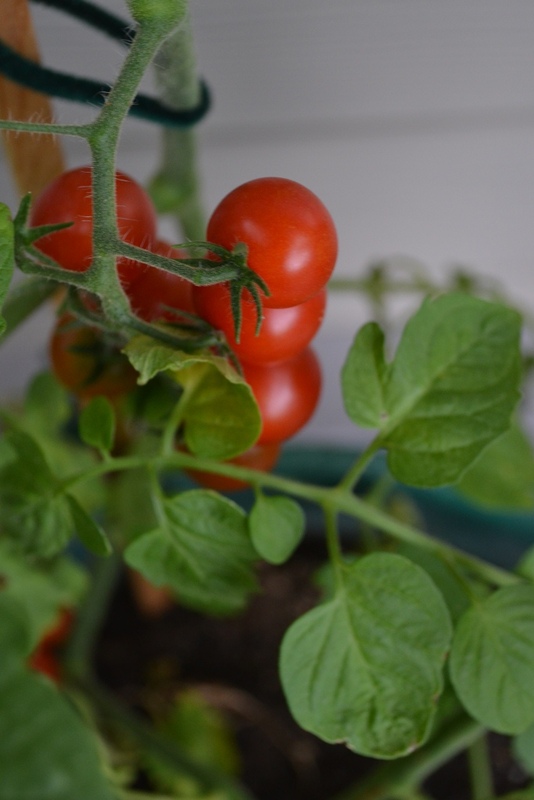 Moral of the story: I’m really, really glad I rescued my cherry tomatoes from the storm! Other moral of the story: waiting is challenging. I used all my cherry tomatoes on this lunch so I’m now going to sit outside by my tomato plants and beg and plead them to ripen faster so I can make more of these delicious skewers. Okay, don’t worry, I won’t really go talk to my plants, but I sure am excited for the next batch of them to ripen up! 2. Spray a cookie sheet lightly with cooking spray. Place washed cherry tomatoes onto the sheet. 3. Cut tofu into small blocks and dry them by pressing on them with a paper towel to extract excess moisture. Next, toss them in a little bit of garlic powder. 4. 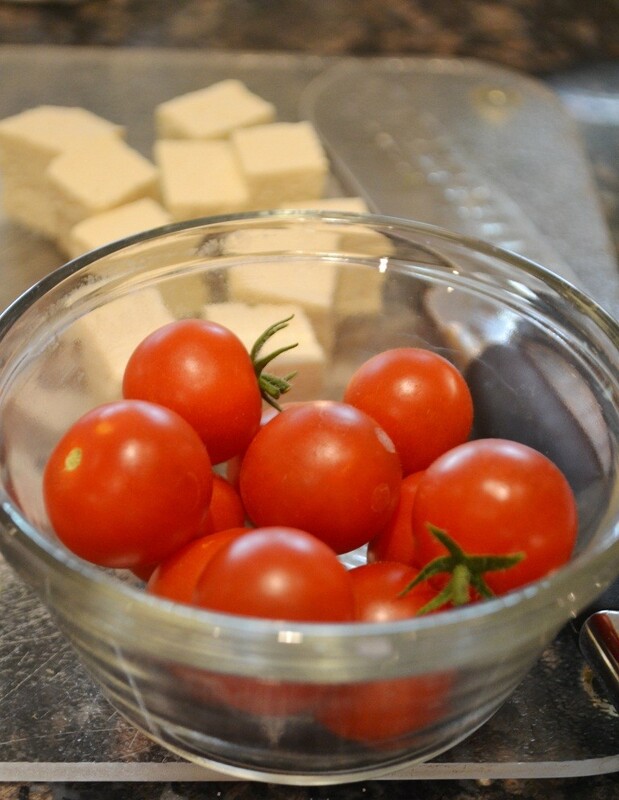 Put the seasoned tofu blocks onto the cookie sheet alongside the cherry tomatoes. Put the sheet in the oven. 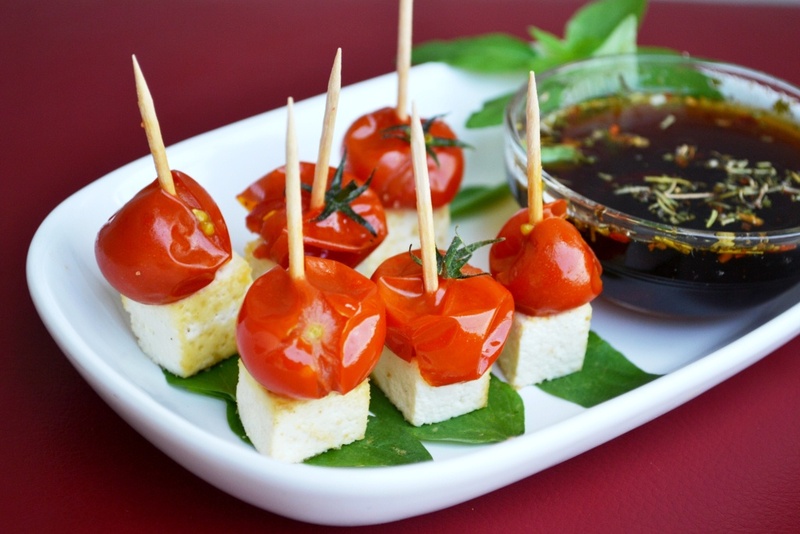 Bake for 10-20 minutes, or until the tomatoes have burst and the tofu is slightly firm on the outside. 5. Grab some toothpicks. 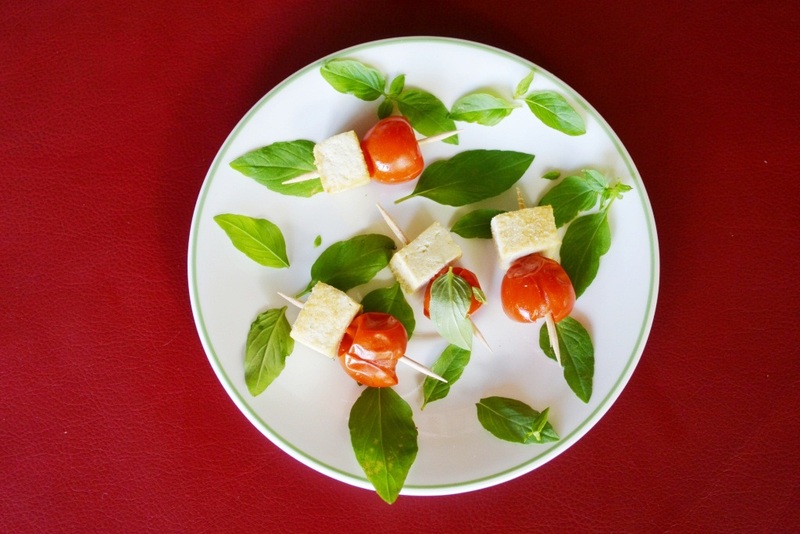 Slide a tomato, a piece of tofu, and a fresh basil leaf onto each. 6. 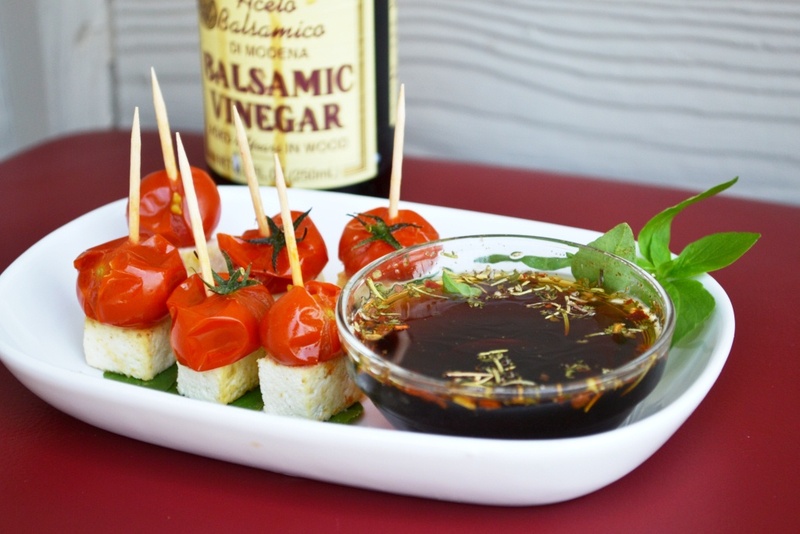 In a small bowl, mix balsamic vinegar with Italian seasoning. Add a drizzle of olive oil if you’d like. 7. 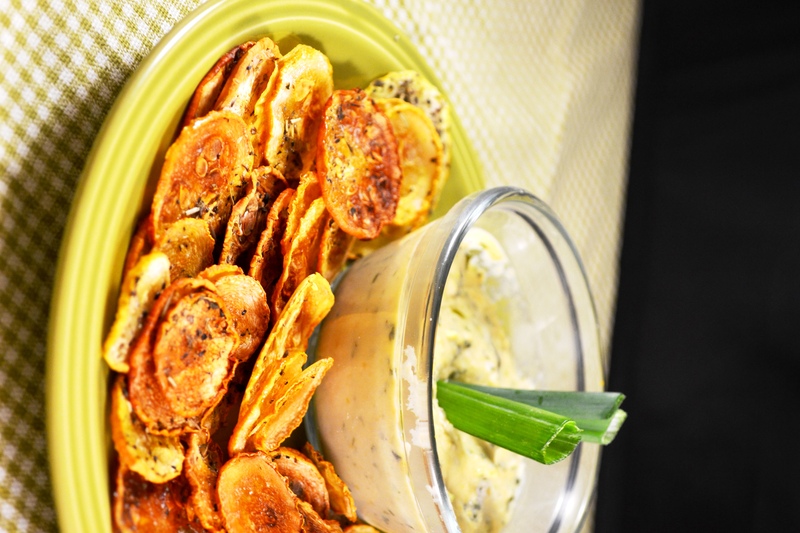 Serve up a savory summertime snack that everyone will feel good about eating! Now, for the reading portion of today’s snacker day: I suggest you read a book called Animal, Vegetable, Miracle: A Year of Food Life by Barbara Kingsolver. No, it’s not a ‘snack-sized’ read like most of the literature I try recommending on Saturdays, but this one is a great book to sit down and enjoy during summer. Barbara Kingsolver and her family grow their own food for a year and chronicle their experiences. If you’ve got a garden of your own, are looking to start one, or are simply interested in eating local, natural, real food, this is a book you’ll probably love. I really enjoyed it when I read it a couple years ago! It came to mind today while I was picking my food for lunch – it felt good that most of my meal came from the vine and landed on my plate mere minutes later. Hope you have a great Snacker Day Saturday! I hope you said yes, because that’s the recipe you’re getting today. Now that the solstice has happened and it’s officially summer, it’s time to get down to business and chow down on some summery food. 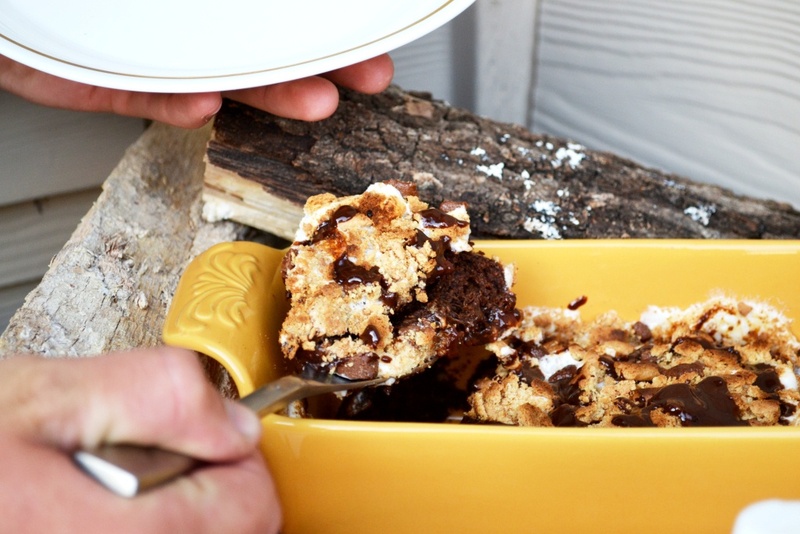 And what’s more summery than a gooey mess of caramelized marshmallow resting on top of a slowly melting chocolate bar and a crunchy graham cracker square? Not much, that’s for sure. I don’t remember if I’ve told you about my love for s’mores before, but s’mores and I are pretty much attached at the hip. Okay, maybe not the hip…I think the more accurate statement would be to say that s’mores and I are attached at the cheek. Or the nose. Or the eyelid. Or the hair. Because that’s where s’mores end up whenever I try to eat them like a normal person. I know s’mores are great while eating around a fire with friends, but I usually only eat s’mores around people I know really, really well. That way, when I’ve got a huge streak of chocolate on one cheek, a smudge of charcoal on my forehead, and marshmallow bits stuck around my mouth, the people I’m with can either 1) tell me to wash my face, 2) walk away from the situation before it becomes too messy and embarrassing, 3) laugh, or if they’re my very, very best friend they can 4) tell me to grab a jar of peanut butter to smear on the s’mores and laugh as both of us get peanut butter all over our hands and faces. My best friend Michelle has visited me at the lake for the past few summers and we always do s’mores together. She’s the genius behind adding peanut butter to a food I didn’t think could get any more delicious, and sticks around while I devour an entire bag of marshmallows by myself. We have a tradition where after we do s’mores we roll around for awhile on my deck until we feel like we’re at least a liiiiitttllee less full and can walk again. S’mores with Michelle are the best. Sadly, Michelle can’t come see me this summer because she’s working at an amazing camp helping kids. They are so lucky to have her! Even though she’s not here with me, I still crave s’mores. After all, it is summer! The other day, Erik and I went down by the shoreline of the lake with a new friend and roasted marshmallows as the sun set. That s’more session got me wanting, well, s’more! I decided to make a cake version of the popular summer treat to share with the family after dinner. 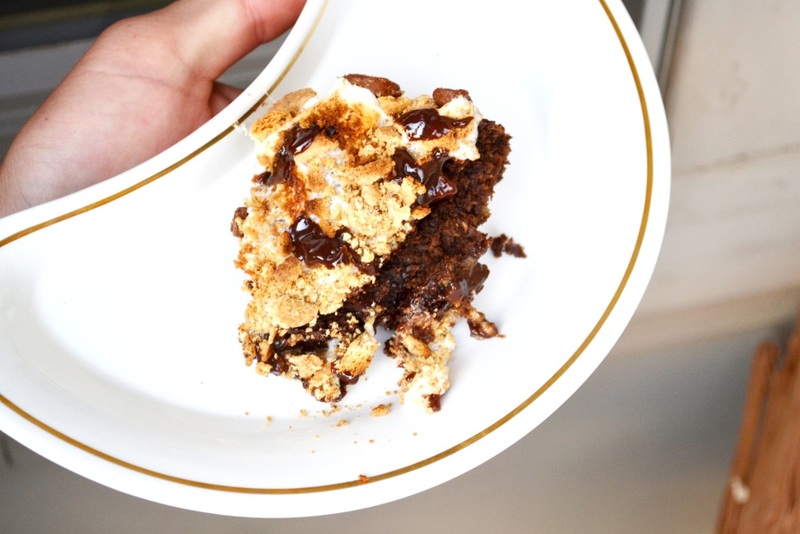 It’s super-duper healthy and tastes like one giant s’more all mixed up and cake-ified (and yes, cake-ified is totally a word). I used bananas as a base so that this cake doesn’t have any butter, oil, eggs, or milk. The bananas give the cake a natural sweetness, and although not too noticeable, the subtle flavor of banana exists under the layers of gooey marshmallows, drizzles of chocolate, and crunchy graham crackers. 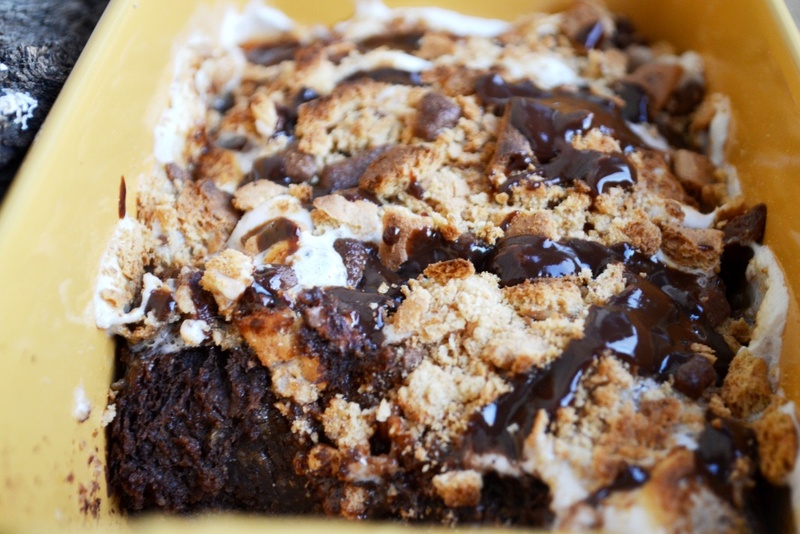 We’re going to need s’more of this cake in our house pronto because we ate the whole thing in one night. Served by itself, or with a scoop of ice cream on top, this cake is sure to be a hit in any home. A perk? I walked away from eating this s’more without a single smudge on my face. Take that, s’mores! Note: the cake is completely vegan if vegan chocolate is used. The topping is as well if vegan marshmallows are used. Eat up, veg friends! 1. Preheat the oven to 375 degrees and spray a bread pan with cooking spray. Set aside. 3. Add the rest of the cake ingredients (with the exception of the chocolate chunks) to the banana mash. *Note on the crushed graham crackers: make sure you crush them so they almost have the consistency of flour. * Mix very well. 4. When the batter is mixed, fold in the chocolate chunks. Gently stir a few times and then pour the batter into the bread pan. You’re ready to put the cake in the oven; you’ll put the topping on during the last 2-5 minutes of baking. 5. Bake the cake for 25-30 minutes, or longer if needed. You’ll need to check the cake at least every 15 minutes to see how it’s progressing. Or, if you’re like me and anxious to sink your teeth into a slice of rich chocolate cake with toppings that even frosting would be jealous of, check the cake every thirty seconds by turning the oven light on. That’s totally normal, right? 6. Anyway, while your cake is baking, you’ll need to do some prep work to get the topping ready. To do this, slice the marshmallows into thin rounds (I sliced each marshmallow into 4 rounds). 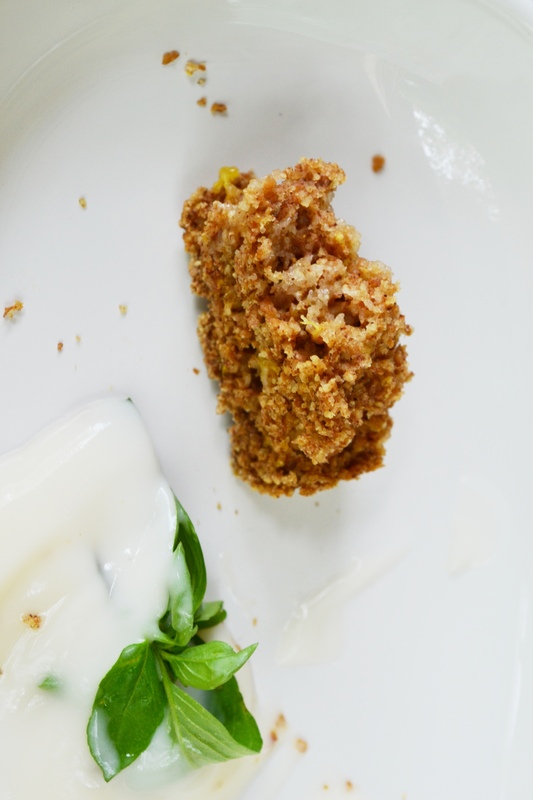 Set them flat out on a plate to make them easily accessible for topping the cake. 7. Crush up graham crackers until they’re just slightly chunky. Put them in a bowl. 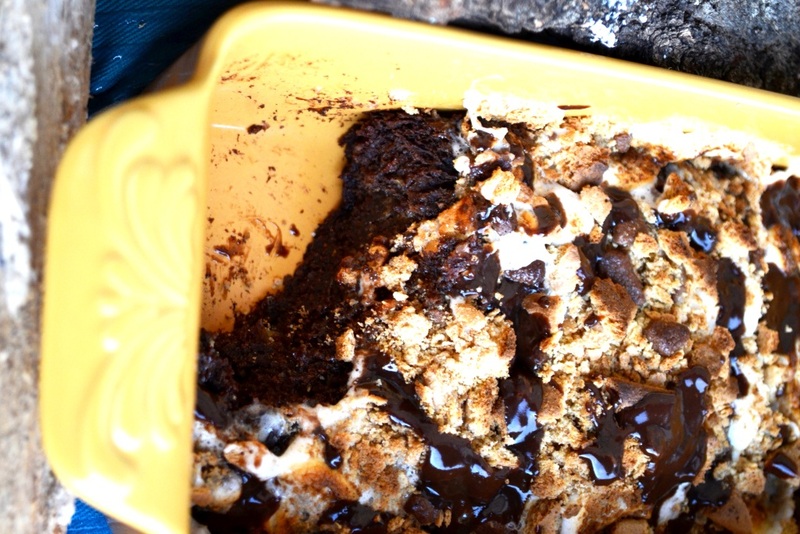 Next, crush up the chocolate bar into small chunks and mix them into the bowl with the graham crackers. Have these toppings convenient and ready for when the cake comes out. 8. When the cake is done baking (again, around 25-30 minutes, or a little longer) go ahead and take it out of the oven and get ready to work fast (leave your oven on). Put all of the marshmallows into rows on top of the cake so that they cover the surface of the cake. 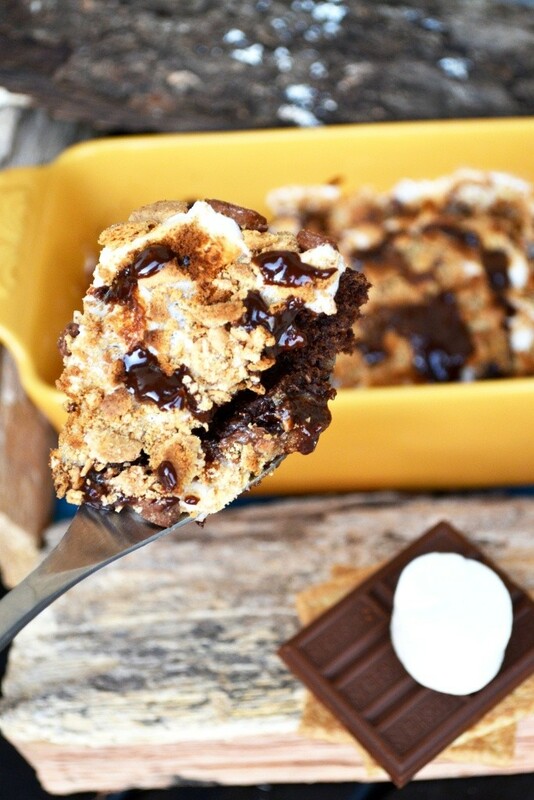 Next, evenly pour your graham cracker and chocolate mixture on top of the marshmallows. Put the cake back into the oven and WATCH IT CLOSELY during the next step. 9. Set your oven to broil and glue your eyes to the oven window. Okay, I’m not being serious about gluing your eyes to an oven, but you need to watch it at all times. Don’t walk away for thirty seconds, or even for five seconds. Stay by the oven for the 2-5 minutes it takes for the marshmallows to puff up a little bit and for the topping to brown. Too long on this step and you’ll have all the fire alarms going off in the house and a s’more cake that looks like you set it in the middle of a campfire. Not what you’re going for. 10. Drizzle some extra melted chocolate on top if you’re a choco-holic like me. Then grab the biggest spoon in your kitchen and scoop out a portion for anyone and everyone around you. Trust me, they’ll all want s’more. Quick! Run to the grocery store and buy a nectarine! You’ll need it to make this. I’d love to share a slice of this with you from the loaf I just made but I’m afraid that’s not possible. Why? Because this bread is going, going… Gone. I hope you’ve stopped reading this post for a second to run to the store to buy a nectarine. 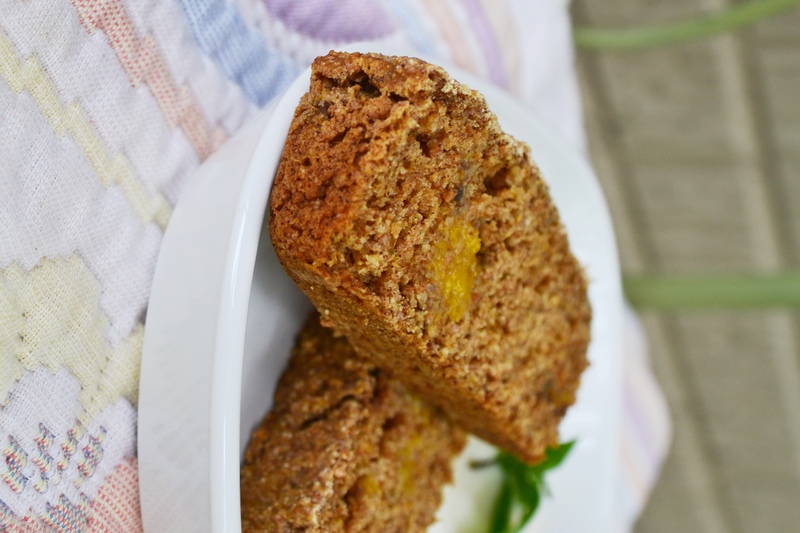 Or a whole bushel so you can make a loaf of this stuff every day. Trust me, you’ll want to. And you won’t feel a single morsel of guilt eating the whole loaf while you’re home alone for the day a few slices because this bread is super healthy. 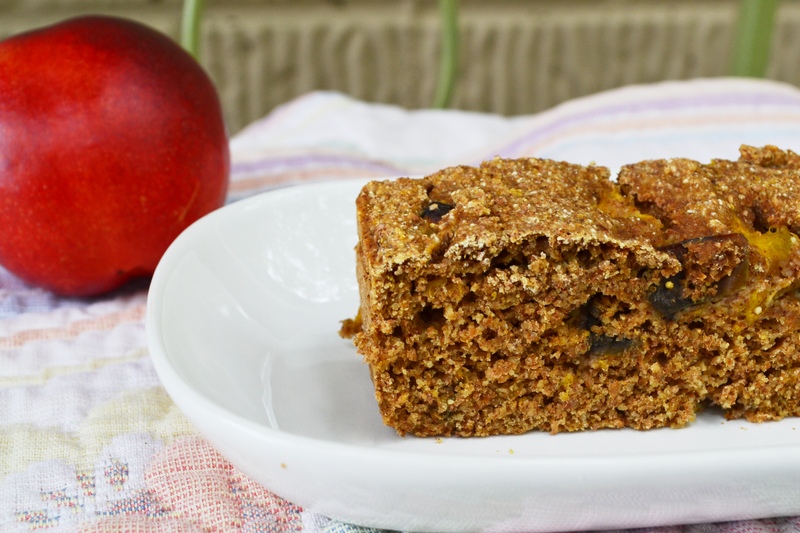 Whole-wheat flour and sweet morsels of nectarine are united in this bread to create a bread that packs the heartiness of honest-to-goodness whole-wheat, and the delicate notes of fresh fruit. It’s the best of both worlds; filling yet delicate in the same bite. I usually wouldn’t urge anyone to make a bread recipe. I mean seriously, bread?? 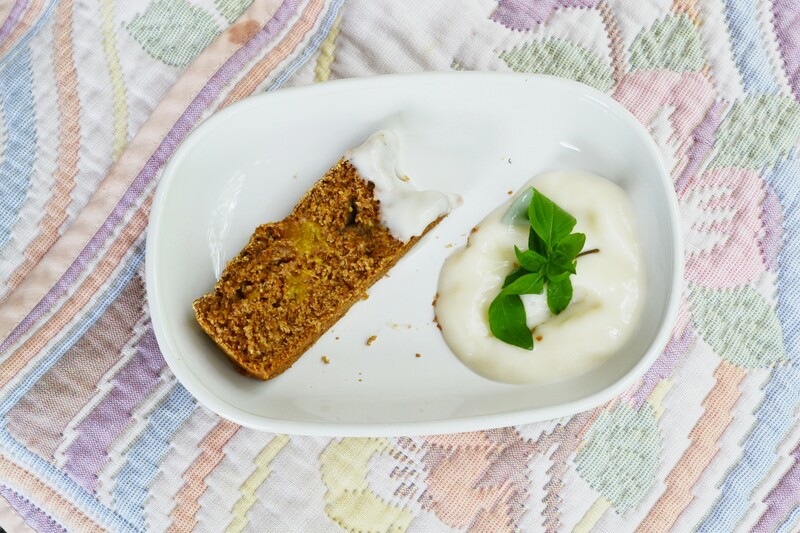 I’m usually not the biggest fan of bread (unless it’s my grandma’s loaded, homemade, fresh-from-the-garden zucchini bread, or my other grandma’s decadent walnut-date bread – either of those I could easily eat in one sitting). But this bread that I made today is really, really good. I dunked a few slices into some vanilla yogurt and slathered some peanut butter on top of another chunk. 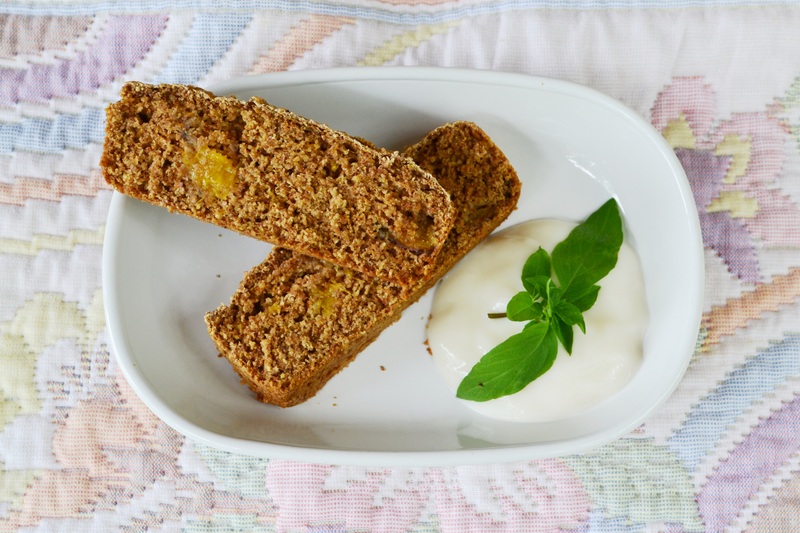 This bread would be perfect as a wholesome breakfast when paired with some yogurt, a post-workout snack when matched with some protein-packed peanut butter and maybe a drizzle of honey, by itself as a snack, or warmed up for dessert and served with a giant scoop of vanilla ice cream. I guess you guys all know what my diet’s going to look like the next few days: this bread for breakfast, lunch, dinner, and snacks. But before I proceed to eat this for the rest of the week, I’ll have to make another loaf. Here’s the recipe so you can make one too! 2. In a large bowl, combine all of the dry ingredients (from flour to sugar). Stir the ingredients so that they are mixed well. 3. Add the ‘wet ingredients’ (from apple sauce to vanilla extract). Mix batter well. 4. Last, add the chopped up nectarine and gently fold the pieces in. 5. Spray a bread pan with cooking spray and then pour the batter into the pan. Bake the bread in the 350 degree oven for 20-25 minutes. Stick a thin knife or a toothpick into the center of the bread to check if it is done. Then, gather your friends and family around and serve up a slice of goodness. If you’re not too busy whippin’ this bread up yet, I’d just like to say that I apologize for the lack of book-related material on here lately. I haven’t been in the mood to write about books on here for the past couple weeks because I’m in the middle of research for school. Research=writing tons and TONS about books. I’m currently reading A Farewell To Arms by Ernest Hemingway which is plenty of book-action for me write now. I hope you caught that last pun. While I am sorry for not providing any book-insight lately, I’m glad to present you with recipes like this one. Hope you love it! Growing up, my parents exposed my brother and I to a variety of cuisines. I remember a time when we lived in Alaska and my parents took us out to a Thai restaurant for the first time. I remember all of the adults dining with us saying “you two are such adventurous eaters”. I never really knew what they meant because to me, trying new cuisines was something to be excited about. At the Thai restaurant in Alaska I fell in love with the mounds of vegetables coated in brown sauce. Erik fell in love with the rice. He’s been a rice boy ever since I can remember. When we lived in Indonesia, he inhaled rice like it was air. We had rice at most meals since it’s a staple in Indonesia. I always added a tiny bit to my plate as a side dish, but Erik used rice as the base and centerpiece of each of his meals. Even when we got the chance to eat something like a hot dog or french fries, Erik would always opt for a heaping pile of steamed rice (sometimes 2 orders of it) with some version of stir fry. When we go out to Asian restaurants together now, I give my rice to Erik because he never can get enough of the stuff. Which is why this week for college concoction night, I decided to teach Erik how to make a hearty stir fry complete with as much rice as his heart desires. 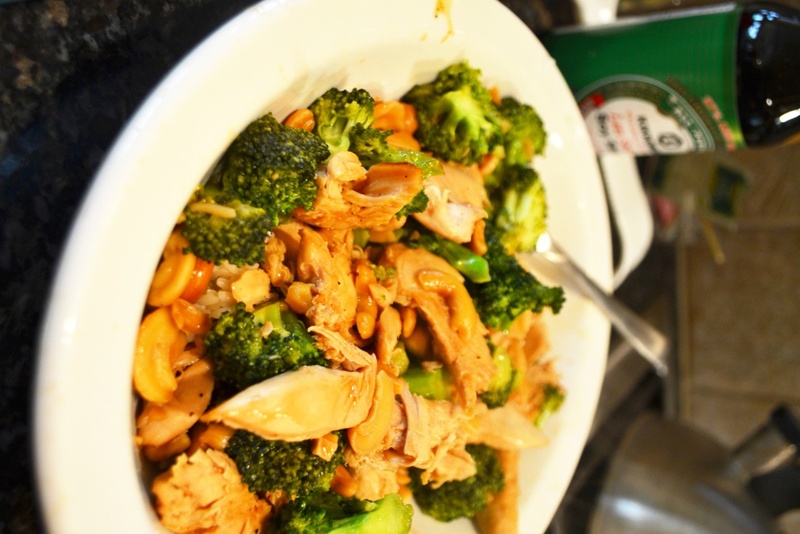 Whenever we go out to Thai restaurants, he always orders the cashew chicken with broccoli – it’s been his favorite for years. 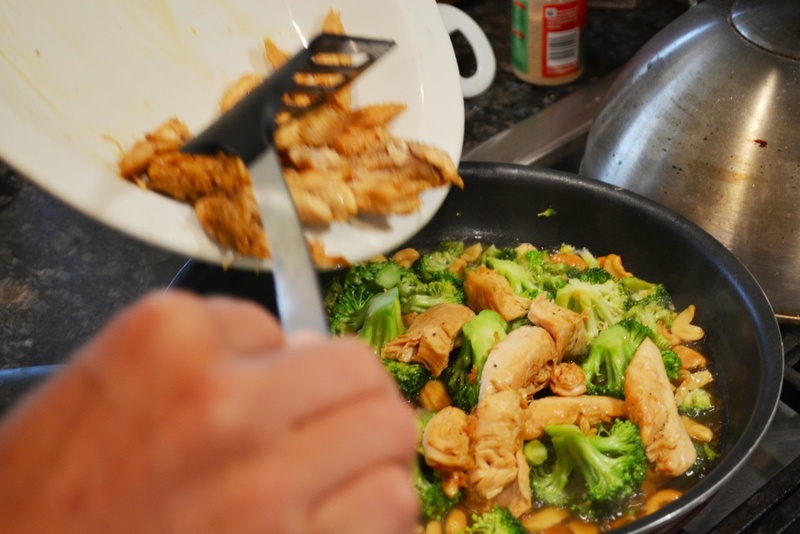 After setting out a variety of veggies for him to add to the skillet this week, he chose to re-create his favorite take on stir fry and make cashew chicken with brocolli for himself. With a massive pile of rice underneath. 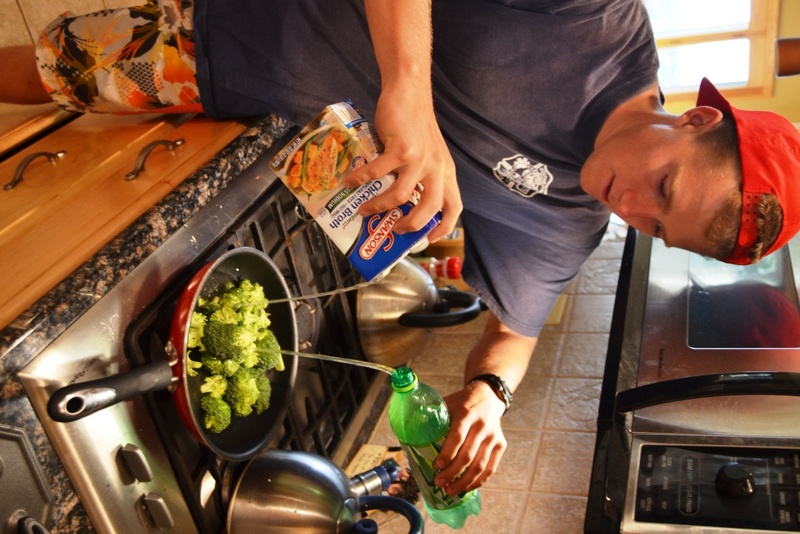 He did a fantastic job making himself dinner (apart from a somewhat sketchy addition of diet mountain dew to the skillet – maybe college kids need a little bit of caffeine with their meals…?) and he thoroughly enjoyed eating what he prepared. I love stir fry dishes because of how easy and versatile they are. 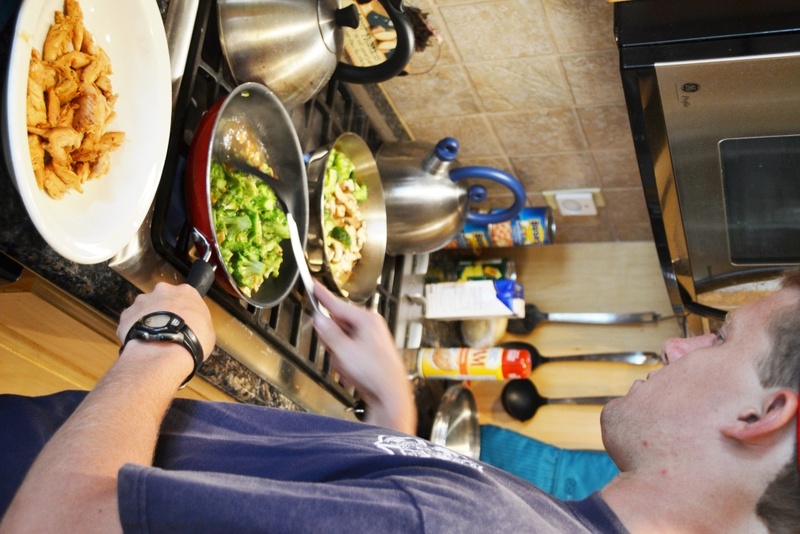 While he created his favorite dish in a skillet, I created mine in one right next to him. I added Shirataki noodles, Seitan strips, broccoli, and mushrooms to my plate. Stir fry meals are great ways to incorporate all of your food groups in one convenient skillet: protein, veggies, and carbs. They are also versatile enough to accommodate for any eating style. 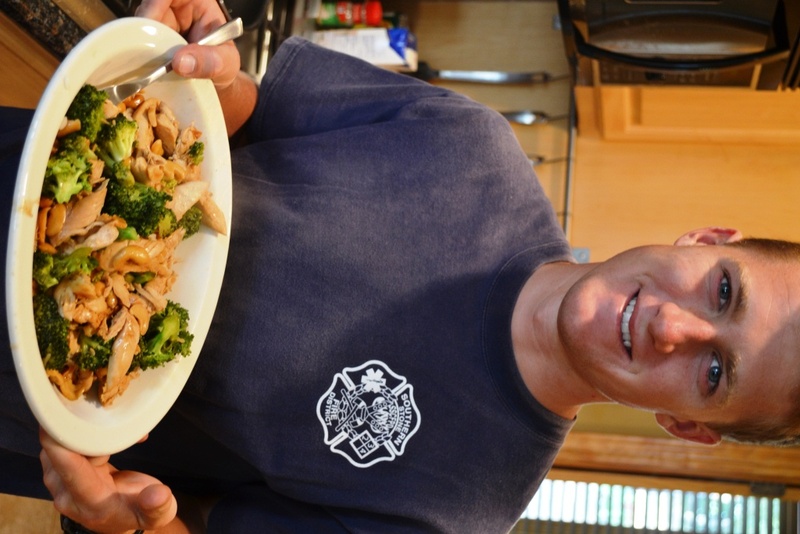 Here’s a recipe for Erik’s favorite stir fry dish! Hope you enjoy his college concoction! 1. In a skillet sprayed with cooking oil, add chicken strips, soy sauce, and a little bit of chicken broth. Put a lid on the pan and cook until chicken is thoroughly cooked (be sure to flip the strips after a few minutes). Add more broth (or Mountain Dew, I guess) if necessary to keep the strips from burning. 2. Once chicken is cooked, set the strips on a plate and let them hang out while you make the stir fry – you’ll add them in later. 3. In a skillet sprayed with cooking oil, add broccoli, oyster sauce, and a little bit of chicken broth. Cook the broccoli (stirring often) until it is tender. At this point, add cashews and chicken. Stir well and cook until thoroughly heated. 4. While these finishing touches are being placed in the skillet, make the minute rice containers according to package directions. 5. Pour the rice into a big plate. Dump the stir fry on top of the rice and dig into a great meal! You won’t miss the takeout containers or the money lost at a restaurant at all! This snacker day is going to be a little different than usual. I’ve got a new drink recipe to share with you, but mostly I just want to spend a little time reviewing the smoothie recipes I’ve worked really hard to come up with all week. Also, I’ve got something to celebrate – read on to see why I’ve got a big smile plastered on my face right now. First, I’ll go ahead and give up my recipe for the day. I’ve got no pictures to go with this (sorrryyyy), but trust me – this smoothie is so good that if you make it, you’ll guzzle it down before you even have a chance to look at it. Or realize it’s got 3 cups of spinach in it. What?? I got the idea for this smoothie from one of my favorite bloggers Angela, at Oh She Glows. She always raves about these “Green Monsters” that she drinks. There are SO many different variations that she makes that I was overwhelmed by options! And of course, when confronted with a recipe, I of course ran away from it and came up with my own concoction. It’s FULL of some of the best foods you can put into your body, tastes like dessert, and I drink it all up for breakfast. Is there any better way to start the day? 1. Blend it all up and soak up the goodness!! I hope you enjoy trying that smoothie out this Saturday. There’s no better to start a weekend morning than by energizing yourself with healthy foods and feeling great about the way you start your day! I’ve been drinking variations of this smoothie for a week now for breakfast and am often tempted to repeat the smoothie for lunch and dinner. Buuuuuut, life might get a little boring if this was all I consumed, so here’s a quick recap of some other great cool-drink concoctions you can try for these hot summer days. 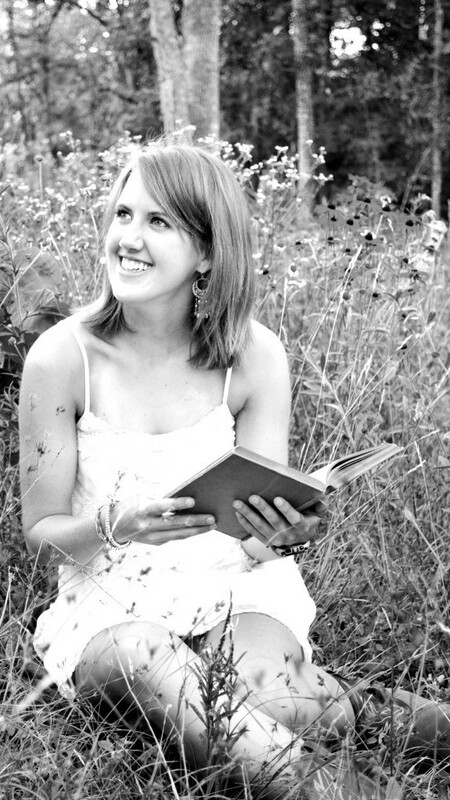 And keep reading…the exciting snacker day news is on the way! Reminiscent of a classic orange creamsicle treat, these smoothies will have both kids and adults screaming for the dream. Tantalizing and tart, these slushies will add some pep to your step and a burst of citrus to your tastebuds. Seasonal strawberries star in this smoothie. Tall, dark, and handsome? 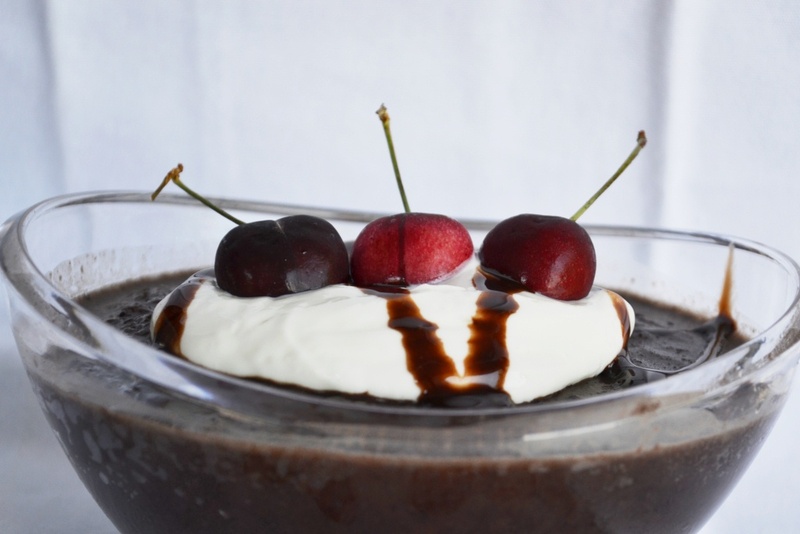 Try tall glass, rich dark chocolate, and a good lookin’ bunch of fresh cherries. It’s been a fun week for me making all of these smoothies. I can say that I’m 100% hydrated after sippin’ on all of these drinks, and probably have had my fill of fruits for the week. Each drink has a unique flavor, and I really love the versatility that exists in this list. Before I leave you to have a great weekend, I want to ANNOUNCE MY EXCITING NEWS! I’d just like to thank all of you who use Pinterest and have been pinning my Squash Chips. Remember these when I made them at the end of March? Since I posted the recipe, I’ve had 37,489 views of the recipe. Never in my wildest dreams would I have expected a little squash chip experiment in my apartment kitchen to reach so many people. That’s what I love about blogging – the ability to connect with people you might not otherwise have the chance to. So, in short, thank you readers!!!! You make blogging so much fun! I love hearing your ideas, suggestions, feedback, and encouragement. Hope you have a fantastic Snacker Day Saturday and a great rest of the weekend. Or in our case, it’s a bowl of chocolate-covered cherries. In smoothie form. 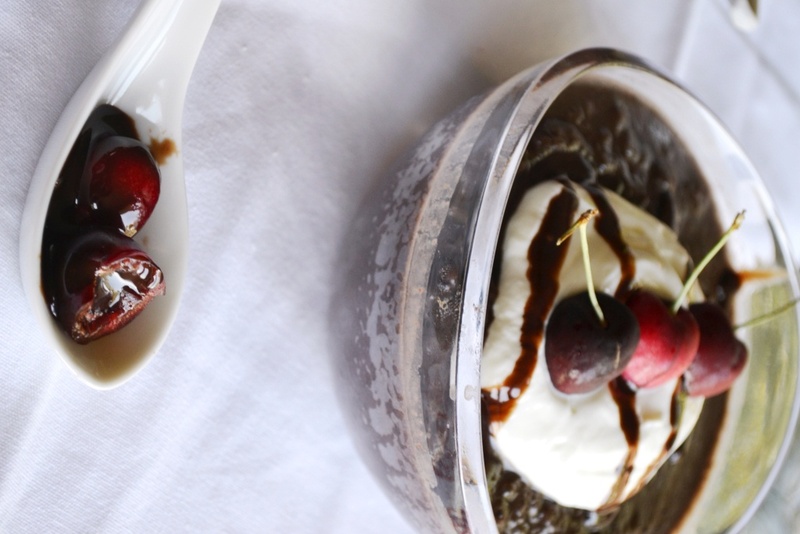 If the idea of plump cherries diving into a bowl of decadent chocolate isn’t enough to make you smile about life for a second, then you should probably just give up on this recipe now. 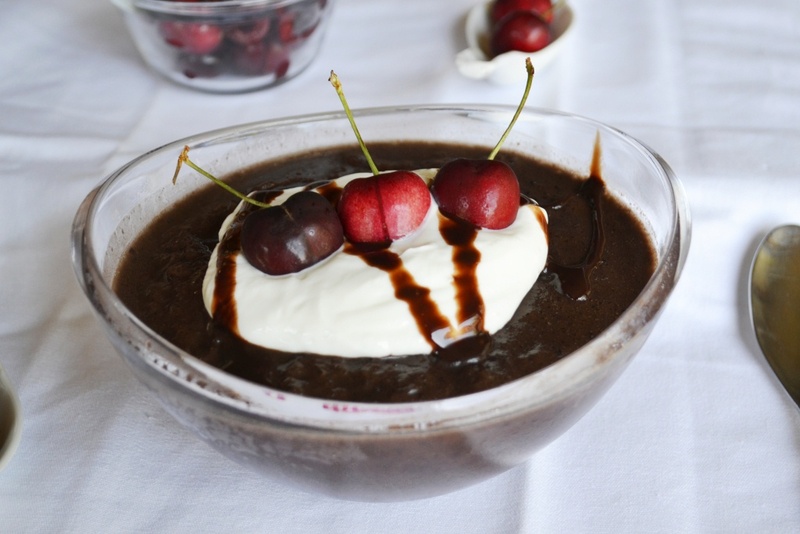 But if you’re like me, and love the idea of a super secretly healthy treat appearing as a great big bowl of rich cherries and chocolate, then stick around. 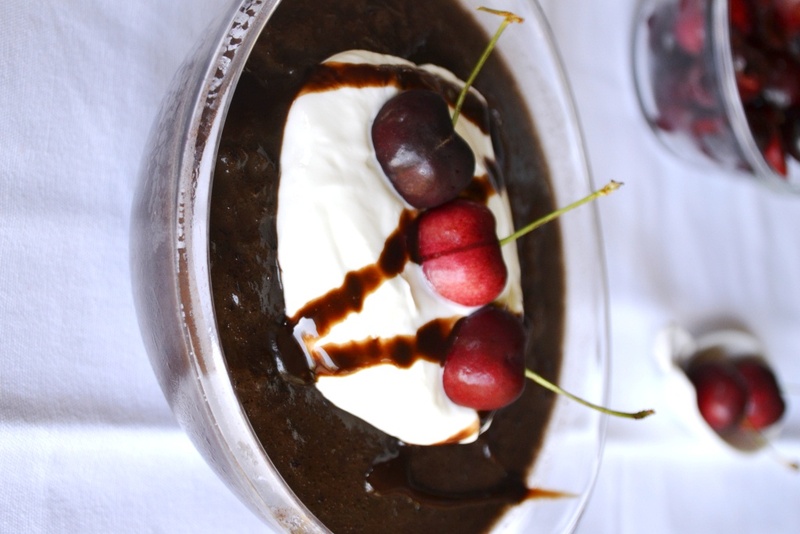 This recipe is great used as a substitution for dessert, a really great sweet snack in the middle of the afternoon, or if you just want an excuse to eat chocolate covered cherries for breakfast. Whatever floats your boat! I enjoyed a huge bowl of this stuff after I came home really hungry from an event I went to. I topped my smoothie with a huge dollop of Greek Yogurt (what a shock, right? ), and some sliced cherries. The blend of textures and flavors added great dimension to the smoothie. Finding the fresh cherries that began to sink into the melting mess of smoothie and yogurt was like scooping out the biggest cookie chunks in a pint of cookies ‘n cream ice cream. You know that feeling, right? I highly recommend this as a decadent smoothie treat. It tastes heavier than some smoothies, but the ingredients are super healthy and light, meaning that this is definitely a guilt-free bowl of goodness. Feel free to sip the smoothie out of a glass like a normal person, but I’ll go right on ahead and eat this smoothie out of a bowl. 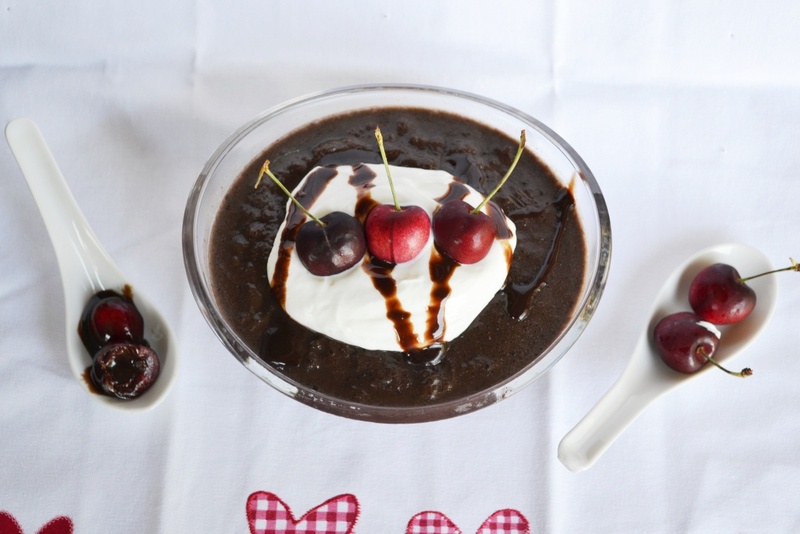 Here’s the recipe for this chocolate-covered cherry smoothie. I hope that life is as awesome as a bowl full of chocolate-covered cherries for you always! 1. Combine everything in a blender. Blend it all up and pour into your favorite glass or bowl. 2. Have fun with toppings – add some fresh cherries to the top, a squirt of whipped cream, some yogurt, granola, or oats. Enjoy!! I hope you’ve all been enjoying the drink recipes all week! 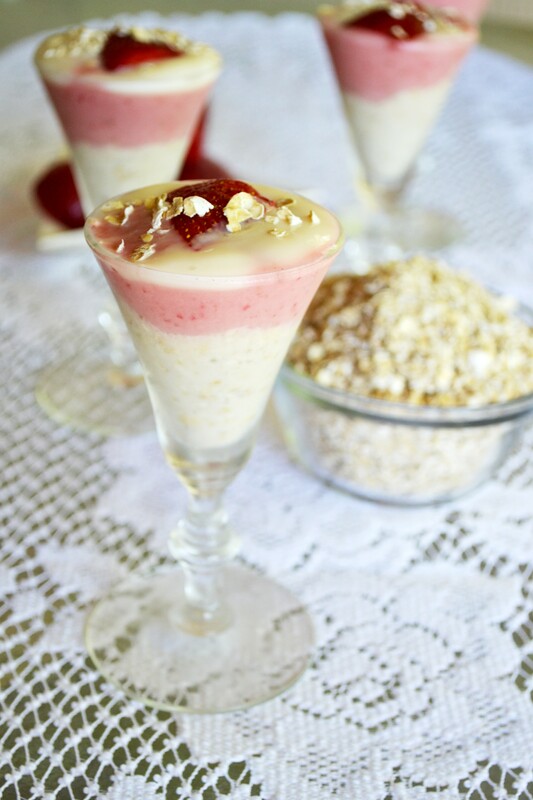 To see a list of all the recipes with images, check out my new drinks page I created. Hope it helps you keep track of your favorites! I’ll just let that sink in for a quick second. Sparkling. 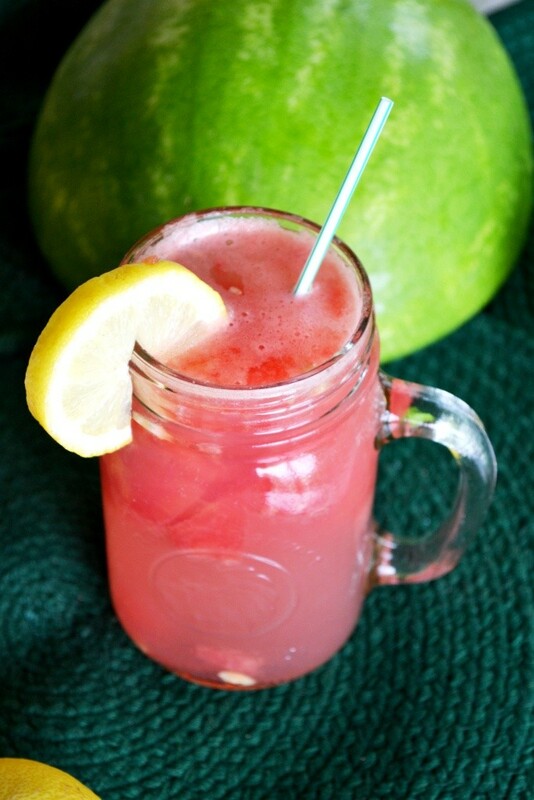 Watermelon lemonade. On the rocks. I’ve been guzzling tons of smoothies and fun drinks this week while experimenting and coming up with recipes for this special cold-drink concoction week and dare I say it? I think this is my favorite drink so far. I don’t know if it’s the fizz action, the playful splash of citrus, or the frozen chunks of watermelon left at the end, but this glass of sparkling watermelon lemonade was gone faster than you can say the name of the drink. So. Good. It’s pretty obvious why this drink should be in your hand all summer long. 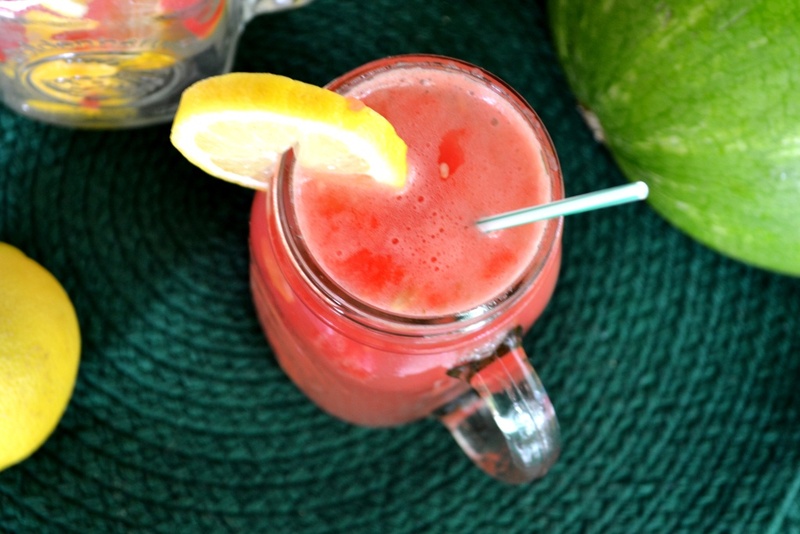 Watermelons and lemonade – does it get any more summery than that? 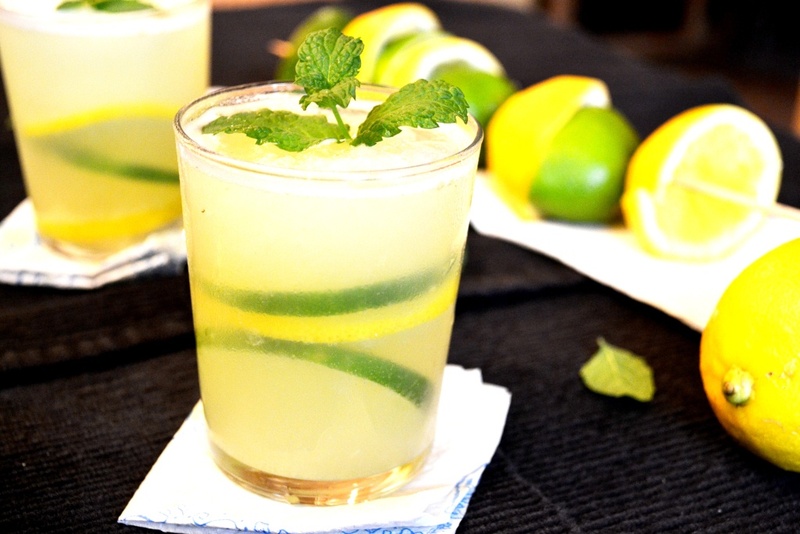 This drink is easy to make in mass quantities and is a far cry from the classic Country Time Lemonade mix we’re all prone to bust out every now and then. I’ve slurped down my fair share of the good ole’ Country Time stuff: my cousins and I used to have a lemonade stand every single summer. We’d plan for days what kind of lemonade to buy, what kind of candy we’d sell, and most importantly, who had the best handwriting to make our sign. Lemonade brings back some of the best memories of summer because my cousins and I grew so close over the years through our tradition. Despite the fact that I love lemonade though, I’m not a huge fan of sickly sweet sugary drinks. I came up with the idea to try to let the sweetness of watermelon shine so that the end product tasted more natural than the lemonade most of us are used to. Also, I’ve become obsessed with freezing fruit this week (blame it on the green monsters I’ve been drinking each morning for breakfast) so I decided to freeze watermelon in an attempt to use them as ice cubes in this drink. Mission accomplished. I chopped the pieces of watermelon a little bit to get more of a slushie-style ice and then poured this delicious drink in over them. 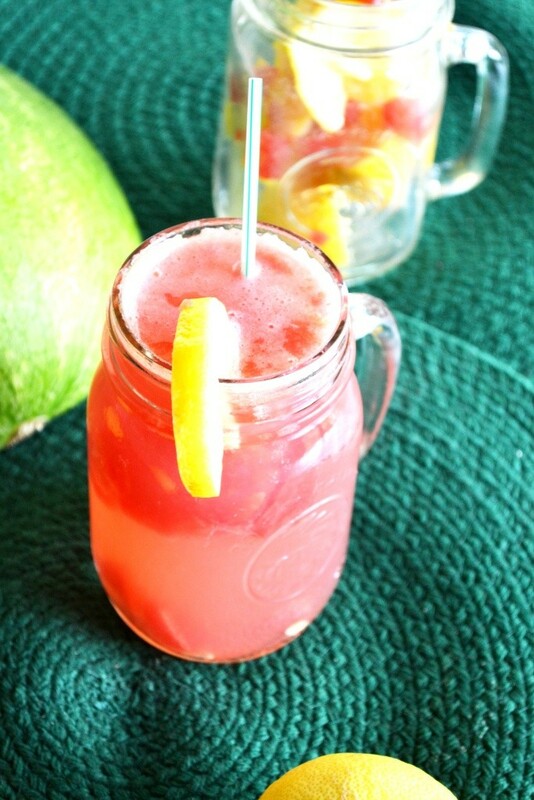 Sorry if all of the watermelons and lemons are gone in your grocery store – it was probably me popping in to buy up the entire stock so I can make this drink every second every day quite a bit this summer. Trust me, it’s like drinking summer sunshine out of a cup. Except it’s ice cold, bubbly, and the perfect note of sour. 1. 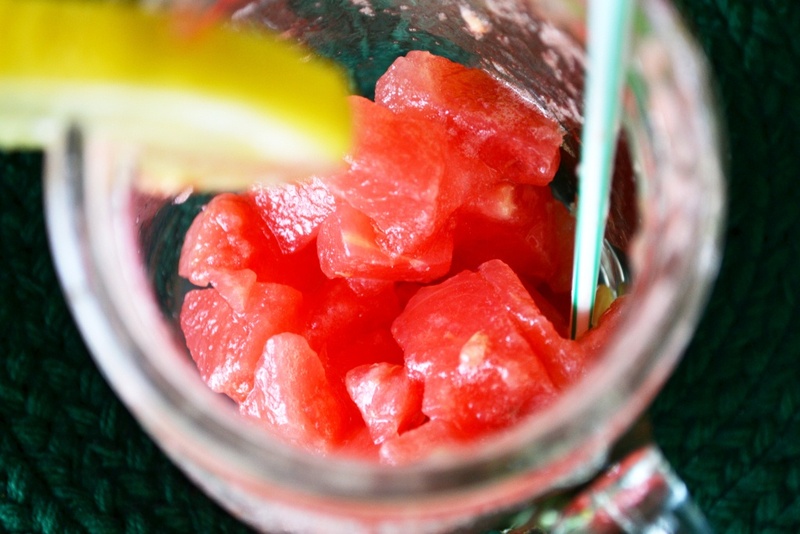 Freeze 1/2 cup watermelon overnight or for a couple of hours. 2. When the frozen watermelon is frozen, go ahead and chop it up to the size ice cube that you’d like. Set aside. 3. With the other 1/2 cup watermelon, put in a juicer (if you’re fancy enough to have one), or if you’re like me, just smash the watermelon up with a fork so that it’s really well broken up and smashed. Then, pour the watermelon juice into the cup that you’ll be using (if making a larger batch, go ahead and pour watermelon juice into a pitcher). 4. Cut lemons into quarters. 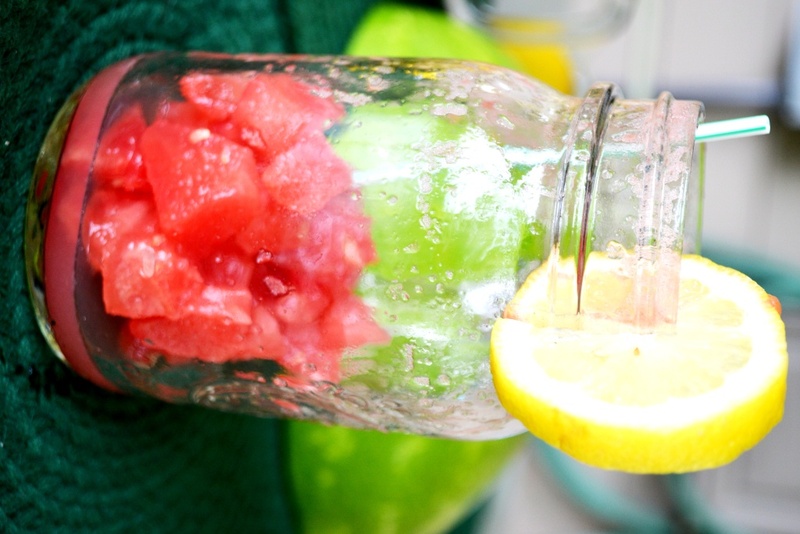 Squeeze as much lemon juice as you can into the watermelon juice. Stir a little bit. Next, add the cup of Sprite to the glass you’re using. Last, add the frozen watermelon cubes. Stick a straw in it (or your face) and chug. Repeat often.